A scrap of paper pokes from the Cookie of Fortune. As a bonus action, you may remove the paper and it will reveal what an enemy of your choosing plans to do on their next turn. Once removed, it will take a day for the paper to reappear. In bed. 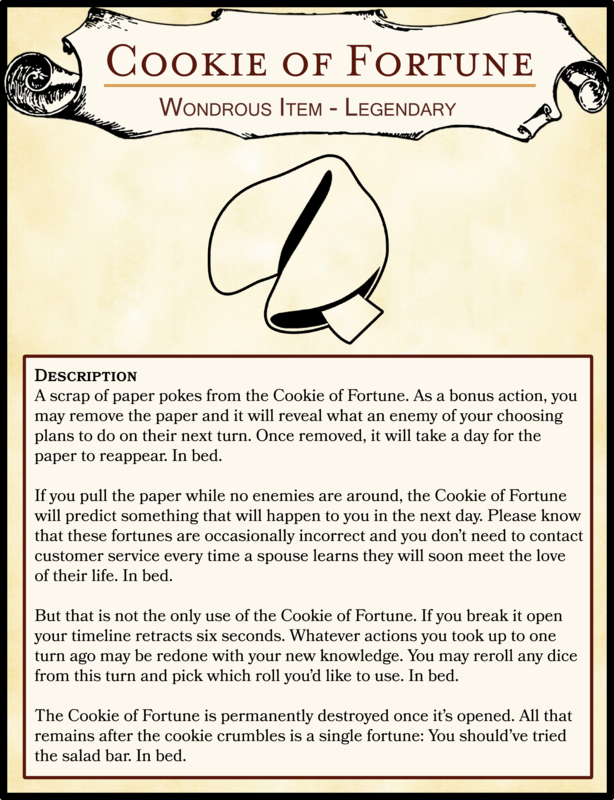 If you pull the paper while no enemies are around, the Cookie of Fortune will predict something that will happen to you in the next day. Please know that these fortunes are occasionally incorrect and you don’t need to contact customer service every time a spouse learns they will soon meet the love of their life. In bed. But that is not the only use of the Cookie of Fortune. If you break it open your timeline retracts six seconds. Whatever actions you took up to one turn ago may be redone with your new knowledge. You may reroll any dice from this turn and pick which roll you’d like to use. In bed. The Cookie of Fortune is permanently destroyed once it’s opened. All that remains after the cookie crumbles is a single fortune: You should’ve tried the salad bar. In bed.